Home › Home and Kitchen › Rc 4 In 1 Wine Bottle Foil Cutter & Corkscrew Opener & Pour Spout & Stopper S..
Rc 4 In 1 Wine Bottle Foil Cutter & Corkscrew Opener & Pour Spout & Stopper S..
Easy to use, it is very easy to place the wine opener on the top of the bottle and turn with a slight squeeze.The screw slides the cork right out with little to no pulling needed. With our extra long screw worm, almost any size cork can be removed without pulling or prying which can lead to a broken cork. THE CONVENIENCE OF ALL IN ONE. We love wine as much as you do, and we also love wine accessories, but where do you keep all of them? All 4 of our accessories are stored within the wine opener itself eliminating a cluttered drawer of additional cutters, bottle stoppers, or wine pour spouts. WINE STOPPER THAT SEALS AIR TIGHT. A stopper can be fun, unique, beautiful, but it's not worth it if it doesn't seal air tight. Ours does! Bottle keeps an additional 1-3 days depending on wine. 2 PRECISION SHARP FOIL CUTTERS are placed within the opener to make foil cutting effortless. With the correct alignment and a couple of twists, you will have a clean cut along any foil for easy removal. Color: Black RC 4 in 1 Wine Bottle Foil Cutter & Corkscrew Opener & Pour Spout & Stopper Set This uniquely designed Ocanon 4 in 1 wine bottle opener set integrates thefoil cutter, corkscrew opener, pour spout and stopper. Gives you a hassle-freewine tasting & enjoying experience! 1. Foil Cutter - 2 foil cutters cut a clean line into any foil. 2. Corkscrew - We intentionally made this screw long enough to cork a bottlewithout having to pull in most cases, greatly reducing any chance of brokencorks. 3. Wine Pour Spout - Located in the handle, and removed with a gentle pull,the spout can help keep the drips at bay. 4. 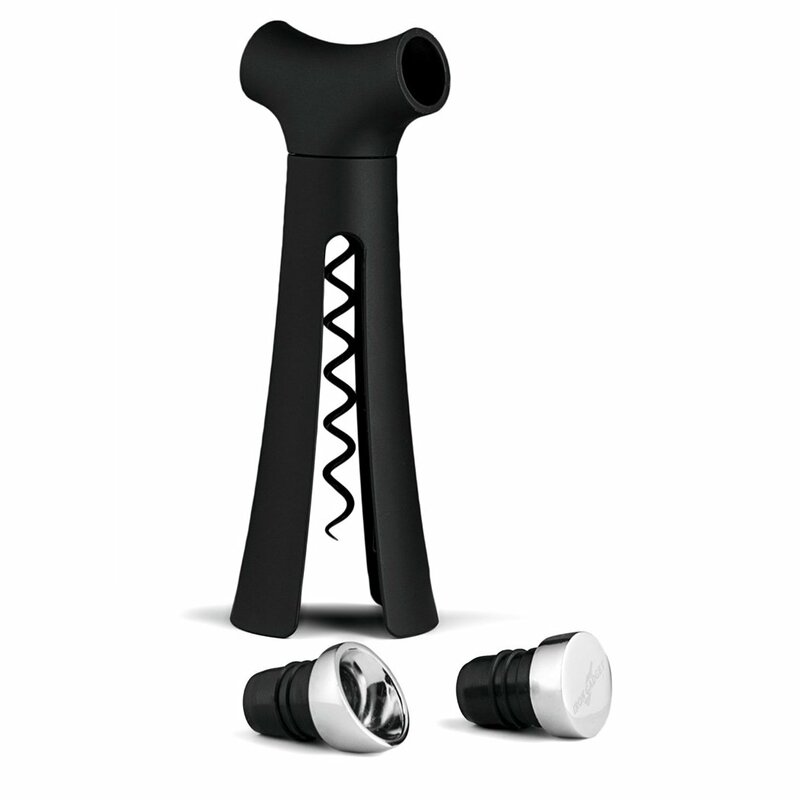 Wine Stopper - Keep wines 1-3 days depending on the wine. Located in thehandle.